The company can trace its history to the Minneapolis Milling Company, incorporated in 1856. The company was founded by Illinois Congressman Robert Smith, who leased power rights to mills operating along the west side of Saint Anthony Falls on the Mississippi River in Minneapolis, Minnesota. Cadwallader C. Washburn acquired the company shortly after its founding and hired his brother William D. Washburn to assist in the company's development. In 1866 the Washburns got into the business themselves, building the Washburn "B" Mill at the falls. At the time, the building was considered to be so large and output so vast that it could not possibly sustain itself. However, the company succeeded, and in 1874 he built the even bigger Washburn "A" Mill. 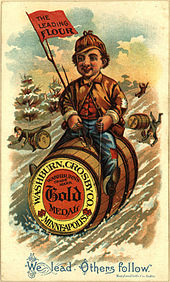 In 1877, the mill entered a partnership with John Crosby to form the Washburn-Crosby Company, producing Winter Wheat Flour. That same year Washburn sent William Hood Dunwoody to England to open the market for spring wheat. Dunwoody was successful and became a silent partner. In 1878, the "A" mill was destroyed in a flour dust explosion along with five nearby buildings. The ensuing fire led to the death of 18 workers. Construction of a new mill began immediately. Not only was the new mill safer but it also was able to produce a higher quality flour after the old grinding stones were replaced with automatic steel rollers, the first ever used. General Mills itself was created in June 1928  when Washburn-Crosby President James Ford Bell merged Washburn-Crosby and 28 other mills. Beginning in 1959, General Mills sponsored the Rocky and His Friends television series, later known as The Bullwinkle Show. Until 1968, Rocky and Bullwinkle were featured in a variety of advertisements for General Mills. General Mills was also a sponsor of the Saturday-morning cartoons from the Total TeleVision productions studio, including Tennessee Tuxedo. The company also was a sponsor of the ABC western series The Life and Legend of Wyatt Earp, starring Hugh O'Brian. In 1970, General Mills acquired a five-unit restaurant company called Red Lobster and expanded it nationwide. Soon, a division of General Mills titled General Mills Restaurants developed to take charge of the Red Lobster chain. In 1980, General Mills acquired the California-based Good Earth health food restaurant chain. GM eventually converted the restaurants into other chain restaurants they were operating, such as Red Lobster. In 1982, General Mills Restaurants founded a new Italian-themed restaurant chain called Olive Garden. Another themed restaurant, China Coast, was added before the entire group was spun off to General Mills shareholders in 1995 as Darden Restaurants. From 1976 to 1985, General Mills went to court as the parent company of Parker Brothers, which held the rights on the brand name and gaming idea of the board game Monopoly, claiming that the so-called Anti-Monopoly game of an economics professor infringed their trademark. The dispute extended up to the U.S. Supreme Court, which ruled against them, saying that while they have exclusive rights to the game Monopoly, they can not prevent others from using the word " monopoly" in the name of a game. In 1990, a joint venture with Nestlé S.A. called Cereal Partners was formed  which markets cereals (including many existing General Mills cereal brands) outside the US and Canada under the Nestlé name. ^ Morioka, Lynne (August 20, 2013). "The return of two General Mills monsters". Retrieved March 26, 2014. ^ "General Mills announces purchase of Good Earth Restaurant chain". Lakeland Ledger. November 8, 1980.